University of Arizona Press, 9780816524938, 272pp. 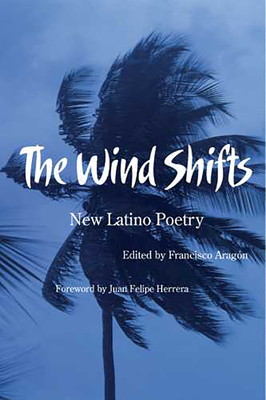 The Wind Shifts gathers, for the first time, works by emerging Latino and Latina poets in the twenty-first century. Here readers will discover 25 new and vital voices including Naomi Ayala, Richard Blanco, David Dominguez, Gina Franco, Sheryl Luna, and Urayoán Noel. All of the writers included in this volume have published poetry in well-regarded literary magazines. Some have published chapbooks or first collections, but none had published more than one book at the time of selection. This results in a freshness that energizes the enterprise. Certainly there is poetry here that is political, but this is not a polemical book; it is a poetry book. While conscious of their roots, the artists are equally conscious of living in the contemporary world—fully engaged with the possibilities of subject and language. The variety is tantalizing. There are sonnets and a sestina; poems about traveling and living overseas; poems rooted in the natural world and poems embedded in suburbia; poems nourished by life on the U.S.–Mexico border and poems electrified by living in Chicago or Los Angeles or San Francisco or New York City. Some of the poetry is traditional; some is avant-garde; some is informed by traditional poetry in Spanish; some follows English forms that are hundreds of years old. There are love poems, spells that defy logic, flashes of hope, and moments of loss. In short, this is the rich and varied poetry of young, talented North American Latinos and Latinas.